Unless you've been living under a rock, you've probably heard about the record-breaking 12 inches of snow that Fort Worth got a few days ago! We've been enjoying our winter wonderland from the cozy confines of our heated home. Ruby likes to look out the window and yell "No! No! No!" (she's not good with the S's just yet). My parents stopped by on Thursday afternoon and we bundled Ruby up and took her out in the backyard to play. I built her a mini-snowman, which she didn't enjoy nearly as much as I did. 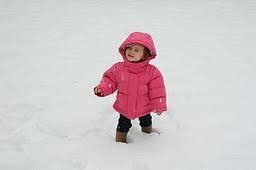 She loved the snow! Well, for about a minute and a half. Then she was done. I'm really happy because it sounds like the snow will stick around for a few more days - it is so beautiful and really makes me miss Colorado. We've been really lucky that our power has stayed on - the neighbors across the street have been without power now for a full day. Hope you love the picture of my little snowbunny as much as I do!